If Robert Duvall is in the movie, I'll watch it. To my knowledge, he's never starred in a weak movie. 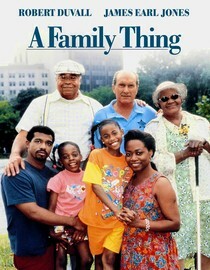 And that's why I selected A Family Thing (1995) from my Netflix cue. Duvall is Earl, who has lived a small-town life in the deep South for 60 years. When Earl's mother dies, he finds out that his real mother is a black woman. He follows through on a promise to his mother to find his black brother and treat him like family. The story is what happens next. All I'll say is that if everyone in America would watch this movie, the black-white divisiveness that persists in our culture would disappear. It's a moving film, with lots of electricity between Duvall and James Earl Jones and Duvall delivering an Oscar-worthy performance, as he almost always does. "Nobody ever knows what it's like for somebody else. That's always the problem." Yes, it's a lame title. But watch the movie, man. I love Bob Duvall. He's one hell of an actor. Thanks for the tip on the movie. I love you and Kathleen, too. You two have a great weekend. I just had to check out your post. I haven't seen this movie, but from your description, it's one I want to see.